Extended Hours on 5$ Bag Monday, April 29, 10am-7pm. 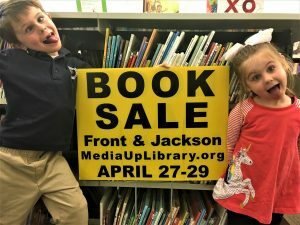 Residents in and around Media donate thousands of books, records, games, and DVDs all year round, and a force of about 25 dedicated volunteers see it all. By the time these wonderful hard-working sorters are done, there will be well over 40,000 books, DVDs and collectibles spreading from the basement up to the second floor of the library.